Development aid from donor countries amounts to more than US $130 billion annually. More than half of that amount comes from European Union nations. However, sustainable development cannot be achieved through aid alone. The United Nations’ 2030 Agenda and the Addis Ababa Action Agenda on Financing for Development have underlined the importance of domestic resource mobilisation and investments – both public and private – for sustainable social, environmental, and economic development efforts to take hold. The paradigm has changed and the European Union’s development policy will be adapted within the framework of the European Union Global Strategy for Foreign and Security Policy in the light of the 2030 Agenda and new global challenges and also taking into consideration the Paris Agreement on Climate Change. The Director-General discusses European Union development policy in light of these developments, paying particular attention to the Pacific region. 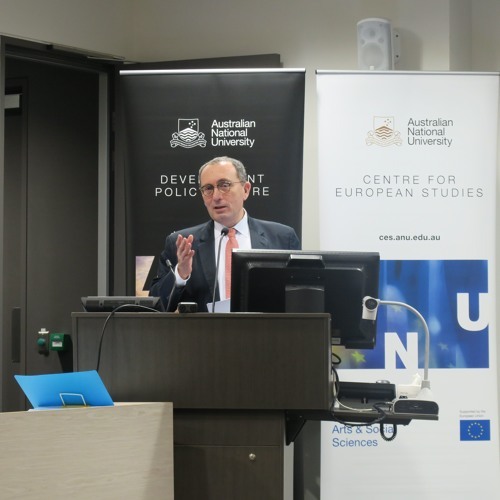 This event was co-presented by the Development Policy Centre and ANU Centre for European Studies. Stefano Manservisi is the Director-General for International Cooperation and Development (DEVCO) at the European Commission since May 2016. He previously served as Head of the Private Office of Federica Mogherini, High Representative of the Union for Foreign Affairs and Security Policy and Commission Vice-President. In 2014, he was the Head of the Delegation of the European Union to Turkey. Before that, he held other positions at the Commission including as Director-General for Migration and Home Affairs and Director-General for Development and Relations with African, Caribbean, and Pacific States. Stefano Manservisi has been a visiting professor at the University of Bologna, University of Roma III, and the College of Europe.